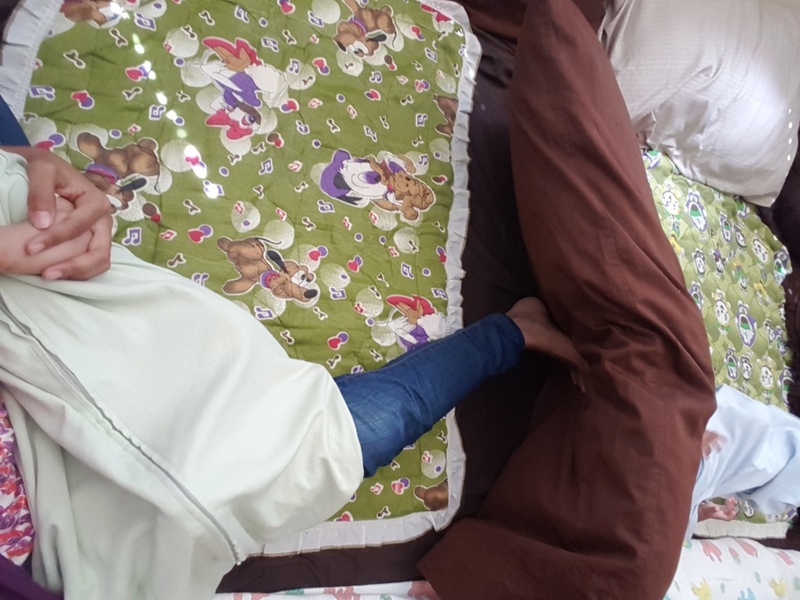 When I was pregnant with Toddler S, I stumbled upon the concept of “floor beds” when I was looking into how safe it was to have a baby sleep on the floor. I did a search which consisted of the following type of key words: “baby sleeping on floor safety”, I came across many search results which included the terms: “Montessori floor beds”. And, this was my first entry point into the world of Montessori. From this my journey, interest and research of Dr. Montessori’s work began. So, again my goal was not to have a “Montessori floor bed” for my first born. 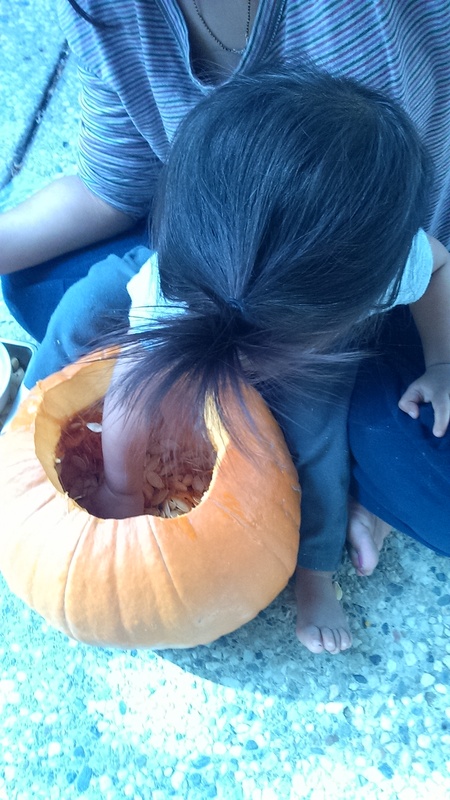 My goal was to have a minimalistic approach in our parenting style which included the types of things we invested in. My thoughts always went back to how did our parents and grandparents do it? 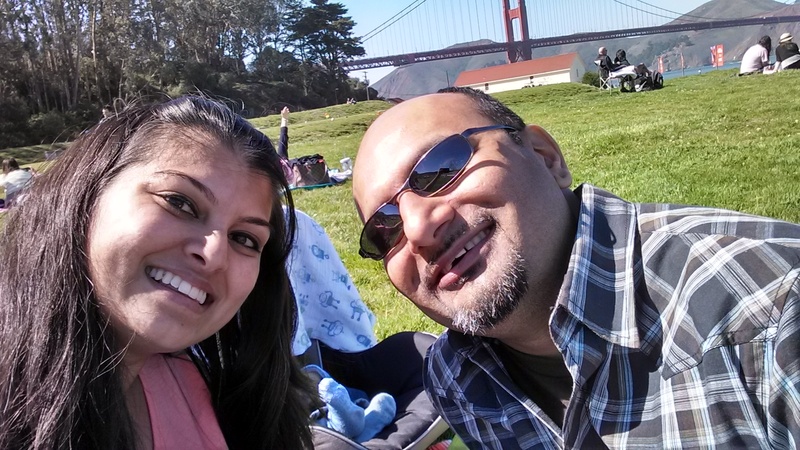 For my infancy and early toddler years I was in India where my parents raised me without what we in the US consider the “basics” for a newborn. There were no cribs, strollers, carseats, highchairs etc in every household with a baby back then. We slept on the floor in India, as did our parents, grandparents, great grand parents. These floor beds are called a pathaari in my native language of Gujarati which is something you lay on the floor to sit/sleep on. It really did make me wonder what was the need for some of these big ticket, and very large baby items which are used for such a small amount of time. Did we really need them? Why couldn’t we try to do it the way our parents did it? I agree not everything is possible given the lifestyle here but not having every single “basic” baby items seemed pretty normal for countries outside of the US. So, our first born, Toddler S, had a very, very basic room as an infant. Fast forward about two years. As we got ready to welcome our twin babies, we did a lot of brainstorming on Montessori floor beds for multiples. Unfortunately, there was not much information on line on this topic. There were a few times where I was desperate for a solution and spent the wee hours of the night with Google. I came acrosss a few bloggers who posted about it at a very high level but nothing that really prepared us for what was to come! Oh what an adventure our sleeping situation was those first 4 to 9 months. It was changing by the week, some times by the day. 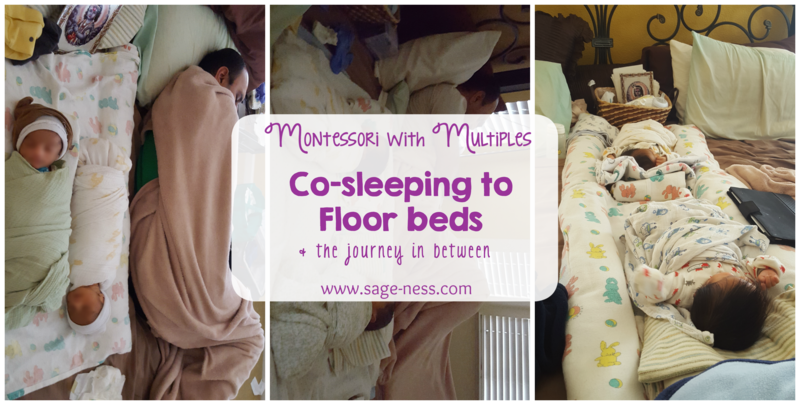 Here is our Montessori floor bed journey at a glance with the twins as babies – read more details about each phase below. The first six months the twins co-slept with us on our cal-king sized bed. They started sleeping in between me and my husband, side-by-side when they were ity-bity 4 pounders. However, as they got a bit bigger, and began moving and wiggling a more, we had to move them to sleeping tandem in between us. This worked until they were about 6 months old and then came mobility. Both babies began turning over and crawling very early compared to big brother which was why we had to move them to the floor sooner. They also pulled out of their swaddles very early on. (Yes, we swaddled all of our babies the first few months). It was starting to feel dangerous having both of them on the bed and rolling around, so to the floor they went. As you can see below, the way we positioned the twins changed over the months. 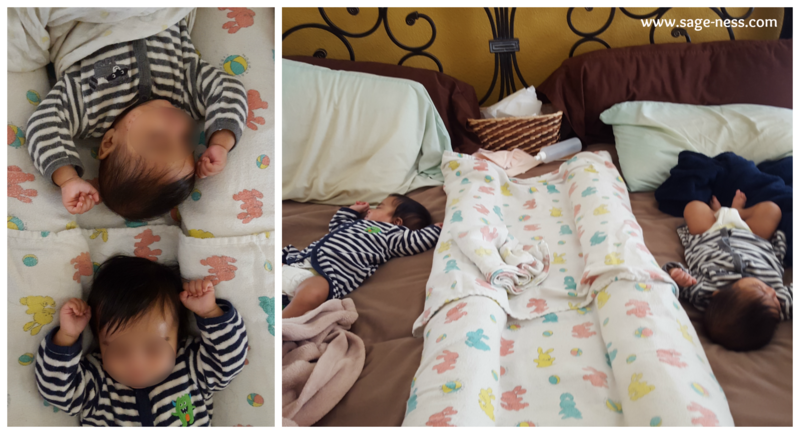 Below is between month 1 to month to about month 6, all in the same bed. So, without boring you with more details about our very dynamic floor bed experience with our twins, I will try to depict it through pictures (whatever I managed to capture during those very zombielike months). Believe me when I say, it was SO, SO, SO hard! Cribs would have been a peace of cake compared to this but it was just something we did not want to do since our long term plan was to have floor beds for them (not to mention we didn’t own any cribs). Since, big brother Toddler S was occupying his very empty, kid friendly room. 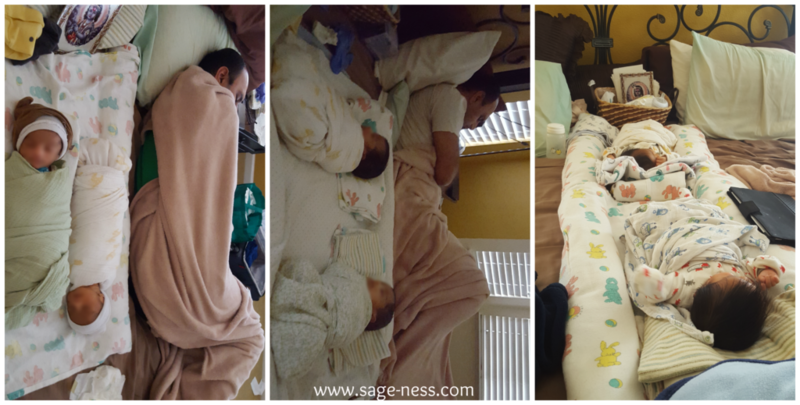 We had the babies sleep in our room on the floor during their early days of mobility. They weren’t crawling entirely at 4 months, so having them in our room was still safe. We would occasionally put them to nap on the floor to ease them into the floor bed idea. 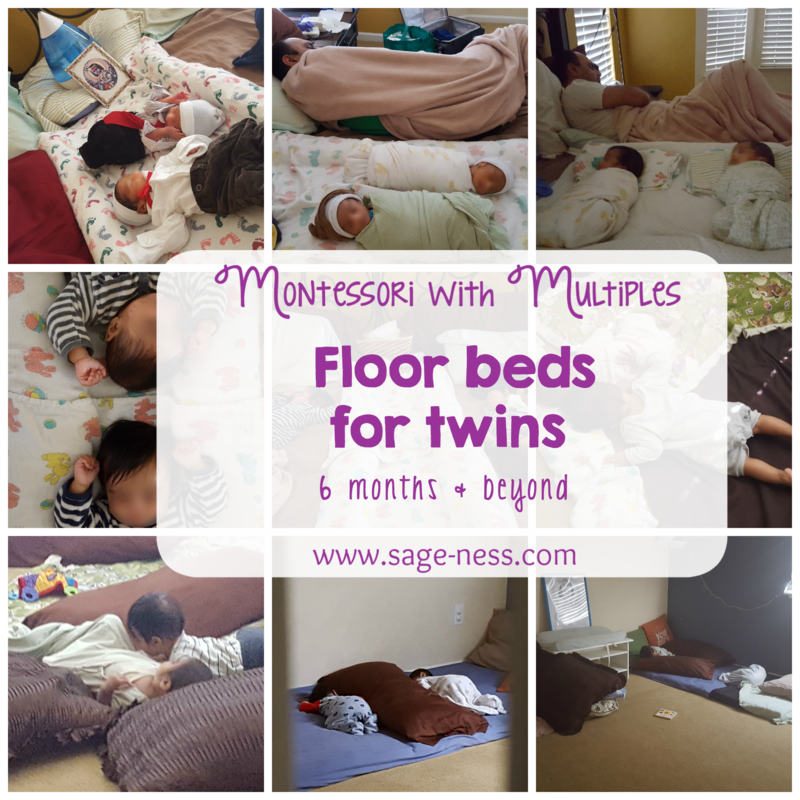 At about 6 months they were becoming very mobile (rolling, early crawling) and it was not safe to have them unsupervised on the bed, so we transitioned them to the floor bed in our room. Although our room is very spacious and fairly empty, there were still aspects of it that were not quite baby friendly and made me uncomfortable leaving them in their unsupervised once they were awake. There were MANY instances we found them in odd corners of the room, including underneath our cal-king bed. Often they were scooting in their sleep, bumping their heads and waking themselves and each other up. 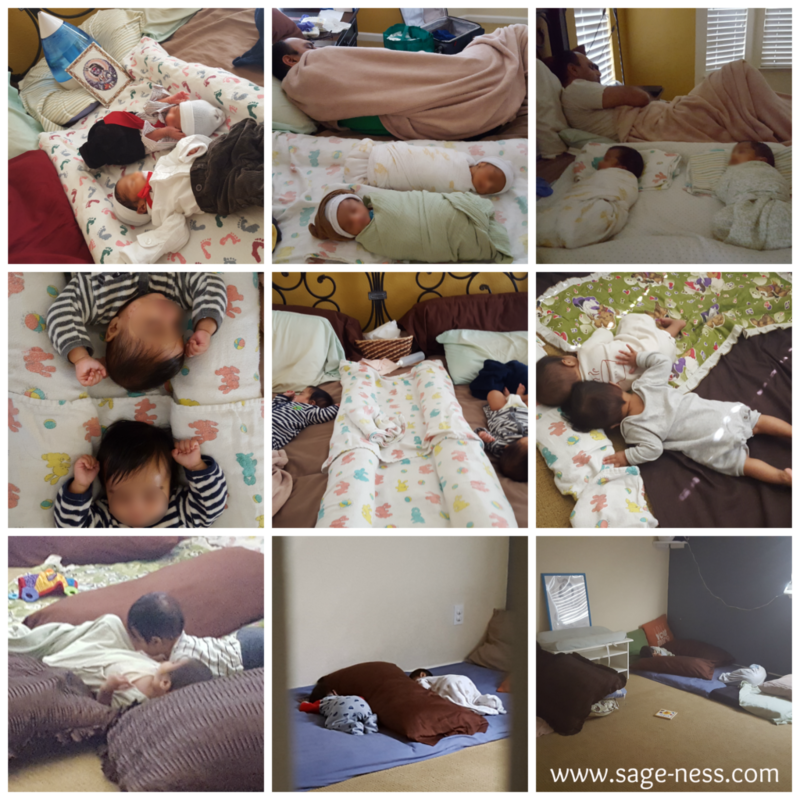 At about 9 months we had to explore other options the twins sleeping situation because nap times were becoming stressful and night time sleep was being sacrificed. 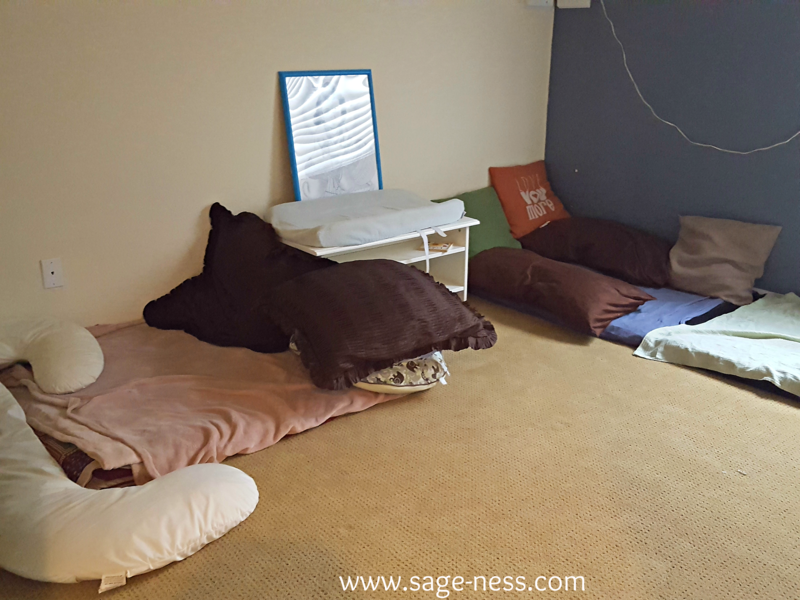 Prior to this we had them on one sleeping space, but that did not always work if one was in a light sleep which was why we created the separate space for both. One thing we learned quickly after a few nights of loud thuds and some bruises is that we needed to block off the door because we would often find the babies banging their heads on the door. We also have abruptly opened the door at the sound of crying to only find a baby curled up right against the door – oops. We did get into a better habit of checking the video monitor before going in but during those zombie nights, instant reaction was to dash in. But these make shift door blocks/dividers were a life saver. It did the job (until recently, they learned how to climb and flip over them, it’s quite the site). It quickly became a gross motor activity for big brother! We learned a lot from our journey and I’m pretty sure every family with multiples has to live through their own experience in this department. Every situation is so unique and different let alone each baby (in this case two!) is so different. 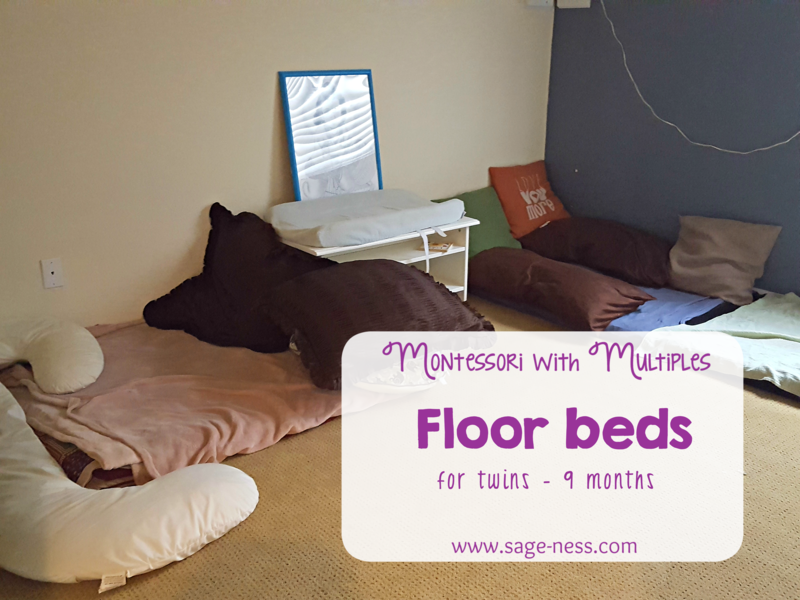 None the less, here are some take aways to hopefully, help other families who plan to use a Montessori floor bed with their twins and/or multiples. Keep in mind when you have floor beds for twins and they are in the same room, things can get very, very tricky. And the whole process is very taxing because one will wake the other, and you will eventually have two babies in your lap. Having two babies to put back to sleep in the middle of the night when you are already sleep deprived, nursing around the clock and trying to function at your 100% for your toddler (and babies) during the day, all of this can really test every ounce of you. 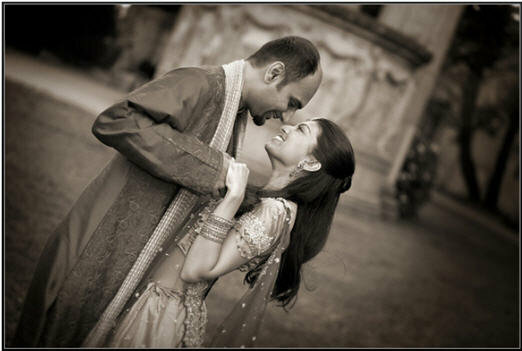 Not to forget, my very supportive husband, would also be up around the clock at night and had to be at work the next morning. Be prepared to make changes as you need to and do what works best for your family and sanity! White noise: This was a MUST HAVE. Trying to keep three kids under three asleep would not have been possible without our white noise machine. 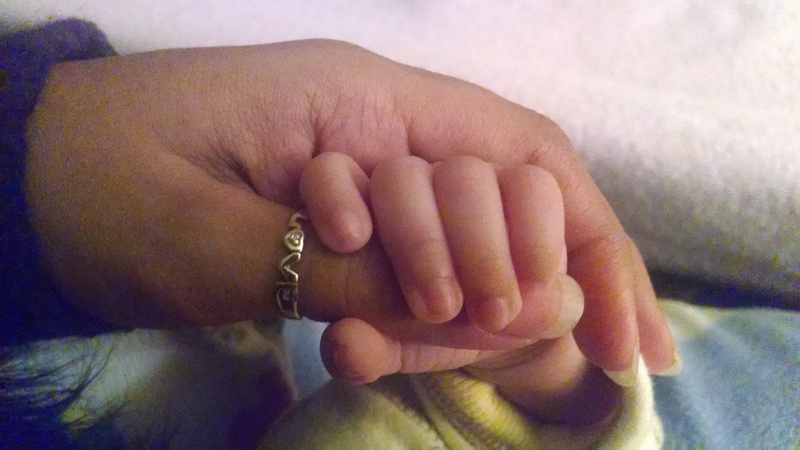 Our toddler was in his own room, but during those early months the babies woke up multiple times a night to nurse, and the last thing we needed was one more person awake. 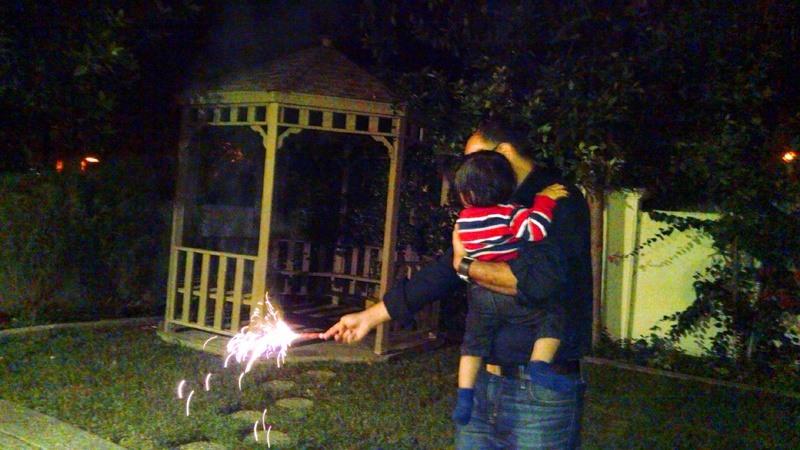 The white noise helped drown out some of that noise and keep Toddler S in his zen. The white noise also helped stabilize the very alarming crying when one of the babies woke up suddenly, preventing or delaying the other one from waking up. Have you ever felt that helpless, anxiousness and gut wrenching pain when your baby is crying and you can’t do anything to sooth them? Now imagine, having two babies crying in the middle of the night because they’re hungry and one of them has to wait. Oh – and the whole time you’re praying that none of the crying wakes up the Toddler sleeping in the other room because than one parent will have to tend to big brother, and the other parent (most often the one with the milk supply, ME) has two crying babies! White noise!!! You need it. Same schedule: I know this is a controversial topic, just like sleep training but we needed the babies on the same schedule to survive and be our best for them. Of course, you get to know your baby and know what their individual needs are too, outside of doing everything together for them which we recognized and respected. But getting them on the same schedule was by far the best thing (and twin advice) we received. It’s probably the most popular piece of advice parents of multiples receive. With the floor bed, the same schedule helped because when one woke up, the other one generally sensed/heard /smelled me approaching so they would wake up and come crawling towards me. Feeding them one after another (and tandem once they weren’t so tiny) eliminated the unknown of whether the other one would wake up in a little bit and if they’d be hungry or not. Sleep training: By the time the babies were about 6 months, we were ready to sleep train them after going through 4 to 7 wakings each night months 4 and 6. And one always woke up the other at this stage, despite the white noise and we could never seem to figure out what it was. If it wasn’t one, it was the other which meant eventually it was both. We were beat. Floor beds made it challenging because a slight creak in the ground, a shuffle or a light awaking resulted in two very awake babies and adults (and on a few occurrences Toddler S, too!). The same pattern was occurring for naps during the day, throw a very wide awake and active toddler into the mix and naps basically were becoming a nightmare. By having them on the same schedule, we were able to use process of elimination to possibly identify the reason for their night wakings. When they woke up soon after feedings, we were able to recognize that the babies were most likely not hungry and were waking looking for comfort, from habit or something else. In our case, we had got to a good point getting both babies to fall asleep comfortably at bedtime. It was the night wakings that were a struggle which is where the sleep training was a must. It was a lengthy and tolling process but very much worth it. By 9 months, we were all finally sleeping through the night. Our night feeds were completely dropped. Things felt manageable again. 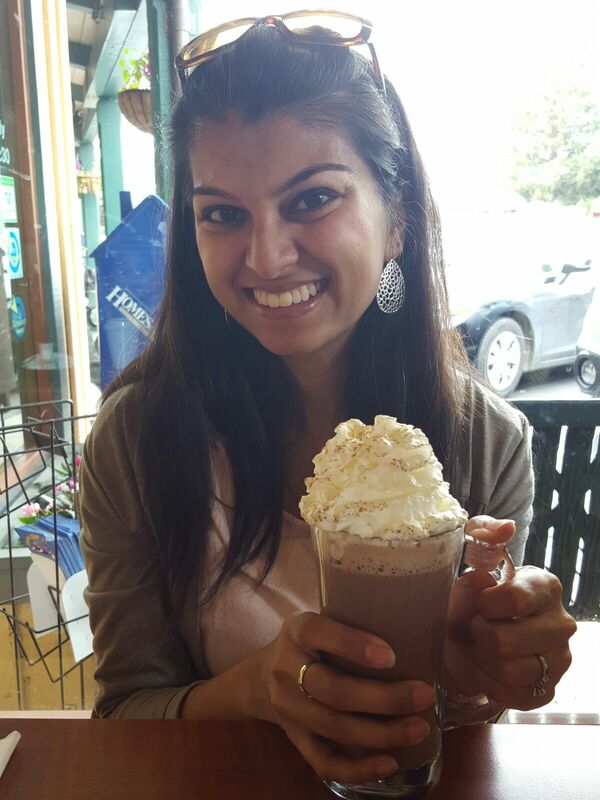 We used a modified Ferber method and after a few hiccups, we stuck to it and stayed consistent and saw results. Stay consistent! It’s hard. Separated spaces: We must have changed their floor beds about five times between their 5 to 8months of age. And every time, we made sure each baby had their own space within the same area. They each had their own blanket to lay on and little perimeter (we used pillows/rolled up towels but I know that may be a safety concern for some). Many nights they still ended up right next to each other but it was a good sleep association for them to have their respective spaces early on. 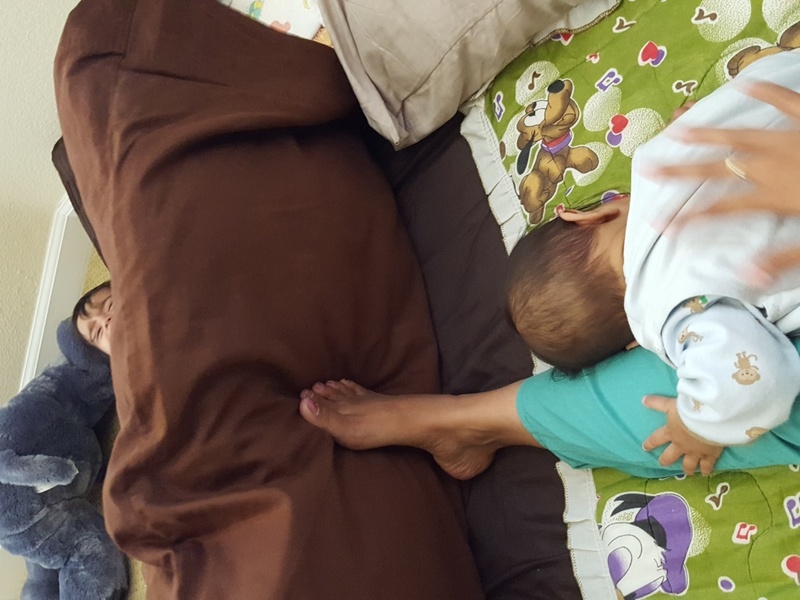 A divider to hide behind: So this is kind of funny but I know you have all seen those viral videos of parents sneaking out of a bedroom once they got their kid to sleep. Now imagine as you’re trying to roll, tip-toe, ninja jump, crawl out of the room after getting two babies to sleep but as one of them is tossing or shuffling they see you. FAIL. Start all over because that baby will most likely make a peep and wake up the other one. Our divider earlier on, when they were sleeping on the floor in our room was a large pillow. We put it between them and if either of them were sleeping lightly, we would slightly prop/tilt it upwards so we could hide behind it. It felt so sneaky. Once the babies moved to another room (we moved them to Toddler S’s room, and he got moved to the guest room), we had a small table in that room which we used to divide their spaces. This table worked as the perfect divider when one baby was struggling to fall asleep and we had to crouch behind it. Seems silly but it’s a real struggle. Separate them if you need to: We had so many days and nights where we just had to separate the babies in order to keep them to get sleep. Early on, Twin A was a better sleeper and was able to sleep for longer stretches of the night. Twin B would wake up more often and this usually threw off Twin A. Separating them helped us get Twin A sleeping through the night which he was already doing while we figured out Twin B’s patterns. Twin A even got to a point where he was able to sleep through Twin B’s excessive night waking and crying. Separating them is such a gamble though because you don’t want to separate them for too where they get used to sleeping in pure silence and then can’t sleep through the crying. It’s all about striking the perfect balance. After separating them for a week or so, we would put them back together each time. The sleep training + separating them definitely helped but we did have to work through the transition once they were back in the same room. It takes a few weeks for them to readjust to each others sounds, cries etc and there was another round of waking each other up but it was significantly better as we went through the sleep training. Don’t give up, just stay consistent. I know some of this may not align with the Montessori principals, but with the twins we had to change our approach for everyones sanity. 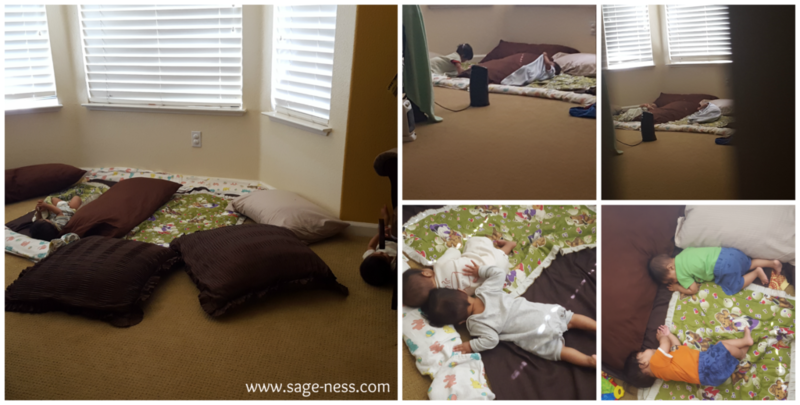 With Toddler S we did not need to sleep train and we were able to work through the challenges of the floor beds and everything in between but with the twins it was a whole new ball game. I am so thankful for where we are at now. Both of the babies sleep in the same room, on their floor beds. Big brother has graduated to a queen size bed in our guest room and mommy and daddy are sleeping through the night. Success! 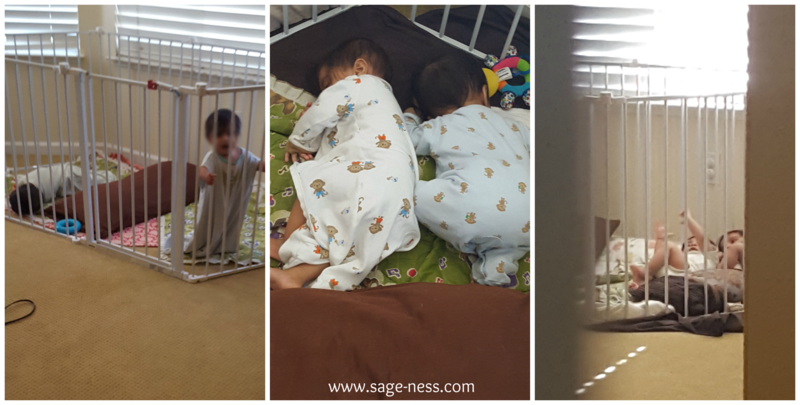 At 13 months, the twins loved waking up and playing together while they wait for one of us to come get them. Over the last few months we have found them on MANY occasions snuggled up next to each other despite their respective spaces. At close to 15 months, they always end up sleeping right next to each other no matter where we put them. It’s so special to see them bond, and share a room together, after having shared a womb for 9 months! I remember feeling so desperate for answers on how to make a floor bed work with twins, so I really hope this post comes in handy for other families in a similar boat! I would REALLY love to hear from other families who have done floor beds with multiple children in one room. How did you set it up? How did you handle night wakings? What was the one must have to make it work for you? Thanks for your post! Working through this right now with my 7 month old twins. I appreciate you taking the time to write this since, as you mentioned, there are very few resources on the internet. Glad everything is going smoothly for your family now. Cheers! You are so welcome Sierra! I hope things are going much smoother now that your twins are a bit older! I would love to hear about how it’s going if you ever stop in again! I stumbled upon your post as I was desperately researching for Montessori floor bed options for our now 5-month old twins. Thanks so much for sharing all your experience and knowledge on this topic! Our twins currently co-sleep with us at night on our (eep!) queen-sized bed but my husband and I are desperate to move them into their montessori room by the time they hit 6 months so we can get some sleep! Same as your twins, ours seem to be more active and talkative than our first born, so our twins definitely wake each other up. How did you manage night time breastfeeding while the other twin waited? Thanks again! Tracy – the struggle is real! I’m so glad you found this post useful because I remember being in your exact shoes when my twins were ready to transition! For breastfeeding, I literally tiptoed in as quietly as possible as soon as I heard the first one wake up or if I was doing a dream feed to avoid waking the other one up (if at all possible). So the good thing about active twins is that they are mobile pretty early on (double edge sword), so it was a lot easier to tandem feed at this point. Prior to tandem feeding, I would try to comfort the waiting twin by just sitting close to him and rubbing his back (it didn’t really work, lol). But tandem feeding for the win! And getting them back to sleep and sneaking out……oh the memories. Please let me know how it goes! Have you tried tandem feedings? Good to try out during the day!